With a new year comes exciting new growth plans for The FJ Company! In an effort to better serve our new and existing clients, we have recently broken ground on what will be our first satellite showroom and service center… in one of our favorite cities: Dallas, Texas! This new location will be run by our Texas General Manager, Joey Pomerenke. Joey recently joined The FJ Company and moved back to Dallas to open the location. He has been a friend of The FJ Company for many years and is no stranger to vintage Land Cruisers. He is excited get more Texans behind the wheel of one of our trucks! We have partnered with our friends over at DuSouth Rovr to immediately start servicing local client vehicles and offering test drives for new clients in Dallas. This location is by appointment only, so be sure to call us at (214) 550-2853 if you want to stop by! Stay tuned for news of our official Sales & Service Center scheduled to open in Dallas this September at the Garages of Texas Lakeview. Sign up for our newsletter for information about the opening! Note: as with all of our locations, we will not sell parts from the Texas location either. We still recommend Specter Off-road for your parts needs! 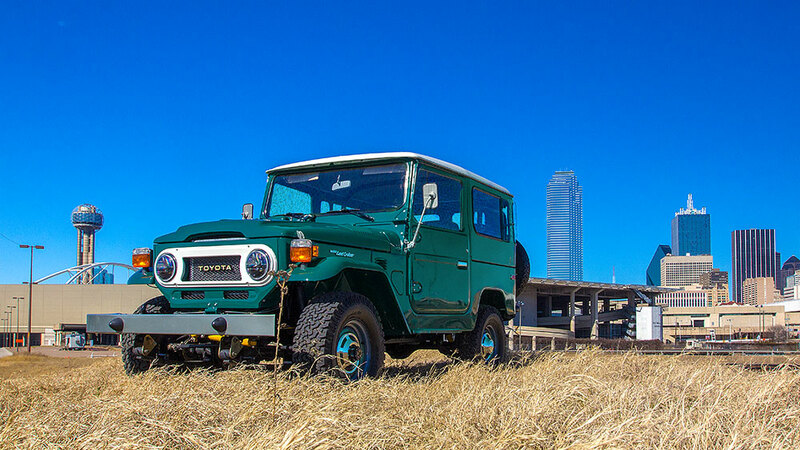 Call us at (214) 550-2853 to set up an appointment to visit and test drive our demo FJ40 in Dallas! Interested in joining the team in Texas? We are hiring a Lead Technician!